This post is dedicated to maximising the Zzzzzs. Seeing as I need around eight hours a night, sleep is extremely important to me. I have a well honed routine which helps me unwind and get to sleep as soon as my head hits my plump duck-feather pillow. Major props to my work mate Sanj from K.O Rasoi, for telling me to get more into yoga, in particular telling me to check out Tamal Dodge, a laid-back Hawaiian yoga teacher. His voice is super soothing and he teaches in a way that isn’t patronising, you just want to crack on and bust out the downward dog. I’ve been working my way through his YouTube videos, piecing together my favourites to create a workout I like. I always now end with his Yoga Morning Mantras – I prefer to do these in the evening mind – because I find that deep breathing and chants really relax me, clearing my mind, allowing me to switch off easier. I cannot swear by This Works Deep Sleep Pillow Spray enough. I am completely obsessed, spraying a couple of times on the right side of my pillow. The mix of lavender, vetiver and wild chamomile completely mellows me out. It’s sweet, floral, soothing and acts as a sedative, sending me into a serene state of calm. Al tends to stay up later than me watching TV and I find the glare from the screen super annoying. To combat this I always sleep wearing an eye mask. Before it used to be one I’d picked up from a flight somewhere, however these days I have the cute fox one above, which my gorgeous cousin picked up for me. It’s cushioned, creates a pitch black vortex that I can relax into and looks hilarious. 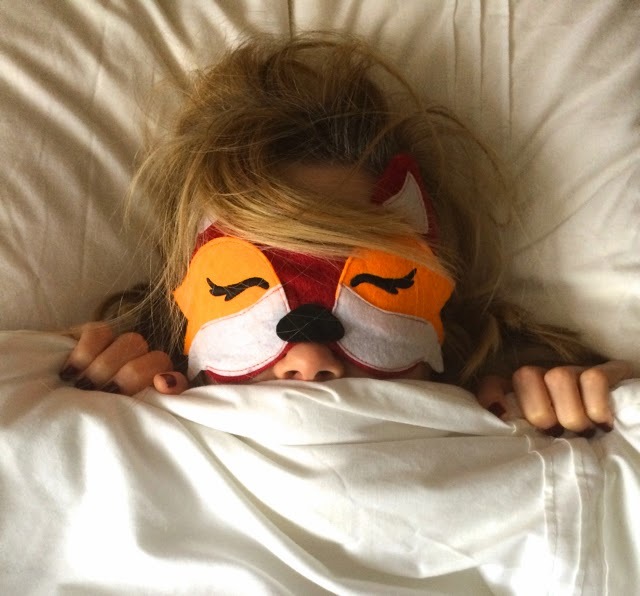 Who doesn’t want to sleep next to a fox? Urban Outfitters have some good masks here. Got any good tips you swear by? Share them below. Confession time. I love listening to Melissa LaMunyon's voice on her YouTube massage videos. Just turn off the screen and listen. Very soothing.